Location: On a cliff in Southold, off of Lighthouse Road (according to the plaque on the structure, the location is: Lat 41° 05' 06.5" N Long 72° 26' 44.0" W). 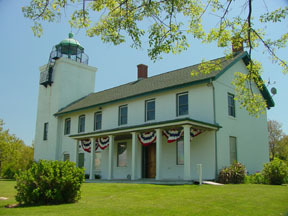 Description: 58 feet; foundation is granite; tower and quarters are brick/granite with a cement wash painted white with black lantern and copper dome; original optic was a Third Order Fresnel; present optic is VRB-25 (1999), one green flash every ten seconds. The tower contains a 29-wooden-step staircase and two ladders of 11 steps each. 1756 or 1757: Colonel George Washington, at the age of about 25, reportedly visited Horton Point and felt it to be a good spot for a lighthouse. He discussed this with Ezra L'Hommedieu, who would later designate the placement of the Montauk light for Washington. 1790: Commissioned by President George Washington. 1850: Eight acres are sold by the Hortons to Charles and Hannah Payne for $100. 1855, July 24: Payne sells the land to the U.S. Government for $550. 1857: Constructed under the supervision of Scottish immigrant William Sinclair, who would serve as the light's first keeper. 1933, June 30: Deactivated. The last keeper, George Erhardt, would stay on to live at the light until September 1938. 1934, January: Southold Park District purchases the grounds and buildings from the Department of Commerce for one dollar. 1999, April: The rotating mechanism for the light fails. The Coast Guard, unable to replace the one-rpm unit, instead installs a two-rpm unit and replaces every other lens with a black panel, keeping the characteristic of the light as one flash every ten seconds. 1999, October: The FA-251 optic is replaced with a VRB-25 optic. Current use: Active aid to navigation/Museum. The surrounding area: The Long Beach Bar, Orient Point, and Plum Island lights are visible if you drive further east. The North Fork also boasts an array of wineries, coastal views and several historical sites. Public access? The grounds are open at all times. Museum open weekends, 11:30AM - 4PM, during the Summer. Other information: During WWII, the tower was used to watch for enemy aircraft. This is the only lighthouse on the North Shore of Long Island between Old Field Point and Orient Point. Who to Contact: Southold Historical Society; 631-765-5500. See images of my visit to the Horton Point light on 5/6/99.